Nataliya Demyanenko of class M18 is the chosen one! One of 200 students who get this year’s DAAD Prize for outstanding achievements of foreign students studying at German universities, chosen out of more than 350,000 international students at German universities and the one and only of the HHL graduates of 2018. Nataliya Demyanenko comes from Moscow where – before HHL – she graduated as a Master in the field of international economics at the Moscow State Institute of International Relations, known as MGIMO University. Henry Kissinger once called it the “Harvard of Russia”, from which the also well-known politicians Genscher and Thatcher received a honorary doctorate once. 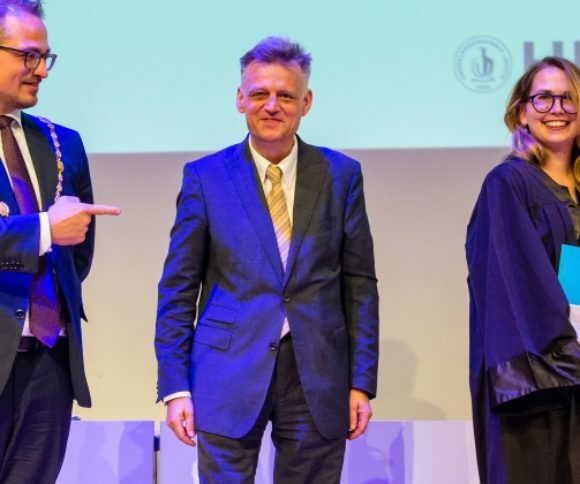 At HHL graduation day Nataliya, new Master with double degree now, was then surprised by the Dean Prof. Dr. Stephan Stubner and the Director of International Relations of HHL Frank Hoffmann (on header photo). The Consul General of the Russian Federation for Saxonia and Thuringia, Andrey Yurevich Dronov also expressed his appreciation of her merits as a student and role model and congratuled her on the award.